Clinton Portis is an NFL running back currently starring for the Washington Redskins, but who played for the Denver Broncos prior to a trade after his second professional season. In college, Clinton Portis played for the Miami Hurricanes. Clinton Portis broke onto the fantasy football scene as a 2nd round selection for the Denver Broncos, and he posted two amazing fantasy football seasons in the Mile High City. Portis began grumbling about a new contract after his second big year, and the Broncos decided to trade him for star cornerback, Champ Bailey. Mike Shanahan and his staff had a long history of replacing productive runners with solid performers, often with guys who were low round draft picks (Terrell Davis, Olandis Gary, Mike Anderson). Therefore, the team tended to devalue the contribution of runners, and were desperate for a shut-down corner to help them against passing powerhouses like Peyton Manning (mainly) and Tom Brady. In his time with the Washington Redskins, Clinton Portis has been productive enough that he has continued to be a perennial 1st or 2nd round fantasy draft selection, though his production has never returned to the levels they were at with the Broncos. One reason is the Denver Broncos in the early 2000′s were a better team than most of Portis’s Redskins teams, though Portis has helped the Washington Redskins make the playoffs two of the past three years. During that time, he has split carries for long stretches with Ladell Betts. One reason for this is that Portis has been injured several times, and Joe Gibbs seemed intent on limiting Portis’s carries to protect him from nagging injuries. Despite this fact, Clinton Portis did well enough last year to move him into the bottom half of the 1st round of most fantasy football mock drafts. Clinton Portis was successfully recruited from Gainesville High School in Florida to attend the University of Miami in his senior year of 1998. Portis was one of only two freshmen in the past 25 years to start at halfback for the Hurricanes, which is impressive, given the talent pool the Miami Hurricanes generally collect. For instance, Clinton Portis replaced Edgerrin James as the Hurricanes’ running back, after James was the 4th overall selection in the NFL Draft, going to the Indianapolis Colts. Portis would in turn be succeeded by Frank Gore, who was in turn succeeded by Willis McGahee (due to a Gore knee injury). Despite his impressive freshman season in college football, Clinton Portis was replaced in the starting lineup by James Jackson his sophomore year. In his junior year, though, Portis returned to national prominence, as he helped lead the Miami Hurricanes to a national title. After his junior year, Clinton Portis declared for the NFL Draft. Portis slid into the second round of the NFL Draft, most likely because of minor character concerns, as well as concerns about this ability to be an every-down back in the NFL. The Denver Broncos drafted Portis, and he proved a perfect fit for the teams zone blocking scheme and West Coast Offense. Portis used a combination of outside speed and cutback abilities to find running lanes in the defense, especially on the stretch running plays the Broncos were known for at the time. Clinton Portis gained over 1,500 yards on the ground after each of his first two seasons. These campaigns were capped by a 5-touchdown performance against the Kansas City Chiefs in his second season with the team. The Chiefs were 11-1 at the time. Despite the impressive stats, the Denver Broncos were happy to trade Portis to the Washington Redskins when Portis began to make contract demands. Because of a rare combination of youth and production, the Broncos were able to receive in return All-Pro cornerback Champ Baily and a 2nd round draft pick. Washington Redskins fans were excited to have a star running, but were critical of the high price Skins owner Daniel Snyder payed for Clinton Portis. There were concerns about the effectiveness of Portis in the Redskins offense, because the team had brought in Joe Gibbs to be the head coach. Though Gibbs is known for his love of the running game, he had tended to prefer a power running attack in the past. Clinton Portis was demonstrably not a power running back, so it was feared the Portis would be forced to run inside plays where he would not only be the least effective, but plays which would expose him to increased injury risks. 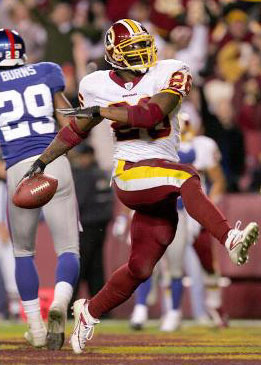 In his four seasons with Joe Gibbs, Clinton Portis remained a factor for the Redskins, and a star player at times. But nagging injuries and Gibbs’ desire to mix in the power running of Ladell Betts diminished Portis’s fantasy value. Despite disappointment on the part of Washington Redskins fans and fantasy football owners, Clinton Portis remains enough of a talent (at only 26 years old) that he is a 1st rounder draft pick in many fantasy drafts every year. With the retirement of Joe Gibbs and the hiring of Jim Zorn, the Washington Redskins are going to change over to a West Coast Offense style of play. Clinton Portis’s best years were in the West Coast in Denver, so there is hope that Portis is in an offense more suited to his skills as a runner. It should be noted that Zorn’s offense is not the same as the Broncos’ offense, and that there are many variations on the West Coast, but there are more similarities in the two than with the Joe Gibbs power running game. USA Today recently printed their "Fantasy Football Edition" and they broke down strength of schedule for running backs against the worst run defenses in the NFL – according to the 2008 stats. Clinton Portis had the easiest strength of schedule, according to USA Today. USA Today reported that Clinton Portis would take on 6 defenses that were considered easy fantasy defenses against the run, which surprisingly rated him as the #1 running back overall in that category. So this could be a really good fantasy football year for Portis. Of course, I’m always a little leery of strength of schedule projections, since these so often turn out to be simply wrong. With the salary cap and how that affects free agency and injuries situations (team depth), it’s hard to know which teams are going to be strong from one year to the next. A few key injuries and any team’s whole season goes down the tubes. Football’s violent, so you never know. That being said, fantasy football is about playing the odds – and the odds show that Clinton Portis has some nice matchups coming in 2009. Remember that on draft day when you’re trying to find a starting back who’ll get all the carries on his team still on the draft board in the 2nd round: if Portis is still there, draft him and enjoy the good matchups. 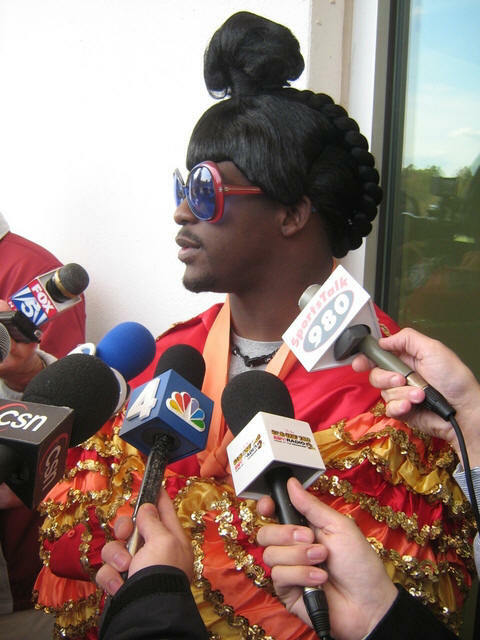 If you want my draft tips on Clinton Portis, I wouldn’t take him as a late first round back. Portis has a history of nagging injuries that crop up way too often to make him the feature back on your fantasy football team. Furthermore, there’s never any telling how a player responds to a new offensive football scheme, so there’s another variable you have to take into account. 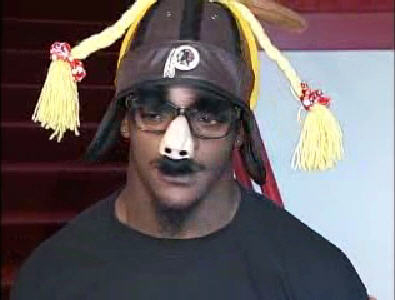 All that being said, if Clinton Portis slips into the second round, that risk becomes different. Draft a running back who is a little more reliable as your first runner; then draft Portis as a high-upside second runner (if you want to go RB-RB). You’ll probably find the other runners in the 2nd round will have just as many question marks as Portis, and not nearly the upside value. In most drafts, this won’t be possible. Portis is going as the 10th to 12th overall pick in many mock drafts, so he’s unlikely to be there for the aforementioned scenario to arise. If he isn’t, don’t worry about it and pick someone else. Whatever you do, I wouldn’t spend a first rounder on the guy. Clinton Portis will be in an offense he’s more comfortable with, and the West Coast style should also assure he’ll get more catches than the previous few years (if you’re in a receptions league). So unlike the previous few seasons, Portis should have a high fantasy football upside. There’s even the chance that he turns it around and has a season more in line with his Denver Broncos career, which is probably why he’s gone from a mid-2nd rounder (last year) to a late-1st rounder this year. Another reason, though, is the fact that the second and third tier runners are a mess this year. I usually don’t mind sitting low in the first round, because there’s one or two major grabs there. This year, though, the lower 1st rounder runners look weaker than in recent years. This might account for Portis’s relative rise in the mocks, because he’s a known name who might finally get his chance to shine. If it weren’t for injury concerns, I might fall in with that line of thinking myself. As it is, I think he’s a better 2nd round option, where all of the runners going have talent, but some kind of question mark. Imagine pairing Portis with Larry Johnson, for instance. That’s a pair with a huge upside, but you could have two guys likely to be on the injury report midway through the first month of the season. More than likely, that won’t happen. You’ll probably see Clinton Portis go off the board in the 10 to 12 spot, and you can breathe a sigh of relief that the guy you were wanting to draft didn’t get selected.